I can’t believe January is almost over, it’s usually a difficult month but once the end is in sight, the nights are getting a wee bit lighter, birds start singing and the snowdrops bloom it seems like the worst of the winter is over. Things I want to achieve – this includes custom orders, things I need to restock, and gallery makes. Health and wellbeing– healthy eating, meditation and exercise, dry January. 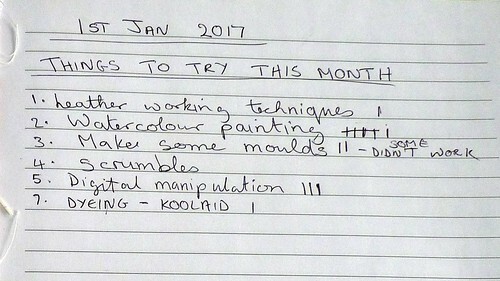 Things to try out – During January I always like to venture down the path of trying something new, or picking up something I haven’t done in a while, this helps me recharge my creative batteries following the madness of December. Each day I put a tally mark next to the things I’d done in each section, as you can see I never did get round to doing scrumbles, but there’s always another month. I’m quite surprised to see what I have actually achieved this month. I got a leatherworking book for Christmas so a tooled leather belt was my first make of the year. I also got a digital textiles book, which has me totally hooked, I was very pleased with this piece. You can read about my digital adventure here. I painted quite a few little watercolours, just for the joy of it. I love juicy watercolours. I made a few felt pictures too. I’m looking forward to doing some larger pieces. 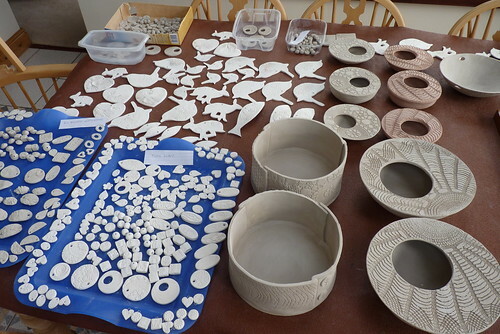 I have been working with clay for the last week or more, I have enough now to fire up the kiln. I am looking forward to glazing, that’s when they come to life, from mud to a glassy wonder, well if it all goes to plan that is. Now I need to write a list of what I hope to achieve in February! This entry was posted in kiln fired art and tagged ceramics, crafting, felting, January makes, kiln fired art, painting. Bookmark the permalink. You have had a wonderfully creative January! I hope that February is just as good for you!